Dupaco Community Credit Union this month officially welcomed its 100,000th member-owner to join the financial cooperative. Camry Fields of Dickeyville, Wis., joined the credit union at Dupaco’s branch in Platteville, Wis. For helping Dupaco achieve the 100,000th member milestone, she was rewarded with a $100 gift card. Fields cited convenience and familiarity as reasons for choosing Dupaco. The credit union has branches near her home and school, plus free mobile banking. Dupaco comes from humble beginnings. 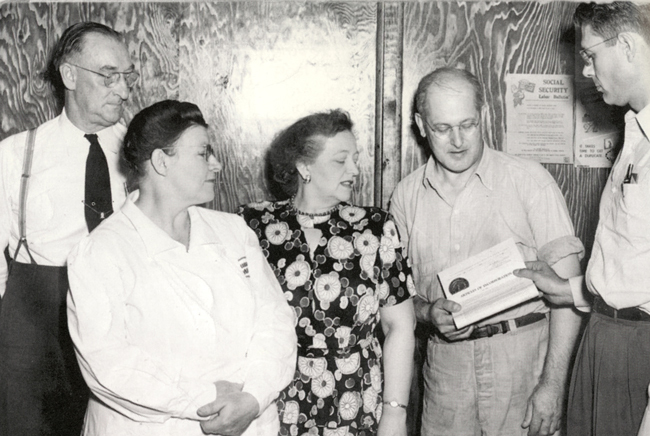 It was chartered as Dupaco Employees Credit Union in 1948, when 10 employees of the Dubuque Packing Company pooled their money and founded the credit union on the philosophy of cooperation and mutual self-help. The original Articles of Incorporation were signed in 1948 by Marie B. Haupert, Melvin Schumacher, Alfred Carroll, R.W. Reavell, Larry Vize, William Moore, Ronald Nennig, Marjorie Alm, Nellie Tucker, and Manley Alm. While its membership has grown exponentially during those 69 years, the credit union’s not-for- profit mission and structure remain the same, according to Dupaco President/CEO Joe Hearn. Dupaco now is making an even bigger positive impact in the lives of more members, added Hearn. As Dupaco’s membership and branch locations have grown, so has its ability to provide an expanded range of cost-effective financial services. Through its free Money Makeovers, Credit History Lessons, Bright Track credit score monitoring and other services, Dupaco continues to help its members get ahead while meeting their lifetime financial needs.